A big hoo-ha is going on in the UK because the new national literacy test includes a test of nonsense word reading. Opponents say the words are too hard for children, and don't mean anything. However, this sort of testing is based both on sound logic and good science. Non-word reading and spelling tests explore a person's word attack skills separately from their vocabulary. They show how well a person can apply letter-sound patterns to new words. When do we need word attack? Word attack is a vital skill for readers and spellers of all ages, and we need to use it constantly. Books, movies, TV shows and computer games have been full of made-up words since Jabberwocky, Heffalumps and Willy Wonka. JK Rowling invented whole swags of them (Snape, Malfoy, quidditch, Gryffindor…), and the Simpsons are craptacular at new words. There's a new fillum called Kath and Kimderella, Sheldon on Big Bang Theory says "Bazinga", people play Blokus and do Sudokus, and on TV there are loads of people with names we didn't know before, like Poh, Devin and Miike. People are sexting each other, wearing burquinis, supporting Movember, suffering nomophobia and going glamping. 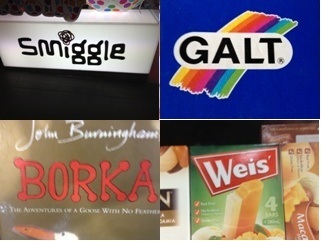 In my local shopping centre, there are businesses called Mosskito, Sumos, Cellini, Frootz, Biba and Mien. The brands of things they sell are mostly not in the dictionary, and brands are everywhere in our homes- just thanks to the latest bout of hayfever I have Flixonase, Rhinocort and Brauer nasal spray in the bathroom cupboard (nope, didn't really use them, but thanks for asking). Maps and street signs are full of new words, as are museums and galleries. On recent visit to Gippsland, we learnt about calcite and speleothems in Buchan, and went to Bairnsdale's Krowathunkooloong Keeping Place to find out about about the Gunai/Kurnai people. Earlier this year on Sydney's trains I read loads of place names I didn't know, like Tuggerah, Narara and Koolewong. Yesterday afternoon on the internet I read about the cutest little animal called a pika, and don't even start me on the new words that have invaded every cookbook and menu – taquito, edamame, soju, and dozens of words for what my dear old dad calls "modern lettuce". Think about how many more words adults know than children do. Words that kids don't know yet are effectively nonsense words to them. I've never had a young learner blink at being asked to read or spell nonsense words, because from their perspective, they're doing it all the time. I tell them the test words are the names of aliens, deep-sea monsters or games played in Biddleonia. One of the ways children learn words and build their vocabularies is by sounding them out. Once you know the main patterns, this works most of the time, though most of us have tripped on words like "epitome", "hyperbole", "gazebo" and "pilates", if we read them before we heard them. What are we doing when we attack words? "age" in "Classage" like "massage", "passage" or all jou-jou and French, like "corsage" and "entourage"? "eo" in "Peopard" as in "people", "leopard" or two separate syllables, like "peony"? "ear" in "Dearm" as in "dear" or "earn"? Or did you go for 2 syllables, "de-arm", thinking they'd cost you an arm and a leg? "ch" in "Chooque" as in "chips" or "chef"? "oo" as in "soon" or "look"? What if this business swapped names with the pet shop? "oe" in "Noe" as in "Zoe" or "toe"? "Kough" as in "dough", "plough", "through", "rough" or "cough"? Literate adults know how to break these words up into syllables and spellings, and which sounds each spelling is most likely to represent, as though they had internalised this list. They think about other, similarly-spelt words, and once they have a possible pronunciation, consider meaning. Wouldn't Deed Poll have zapped Kough pronounced "cow" by now? But maybe her parents called her "Noe" pronounced "no" to counter the surname. Did you think about the extent of homophobia and its impact on business viability, the reciprocity of the pet-owner relationship, or the main motivations of financial advisors when considering plausible pronunciations? Reading is about letter-sound relationships and meaning. To read well, you have to be able to do both. In test situations, it's useful to separate out the letter-sound skills so that you can see perzackly (my sister's word, which I am determined to bring into common parlance) where learners are having problems. Non-word reading and spelling tests can't be beat for pinpointing how well learners can break up words into syllables and sounds, which spelling patterns they already know, and what they still need to learn. Macquarie University now offers great little nonsense word tests free on the MOTIF website. You have to sign in and promise not to misuse them first. Some of these tests have been standardised on large groups, so can be used to work out whether a young learner's word attack is on track for their age. It can be tricky for non-experts to tease out from the results of such tests which spelling patterns a learner needs to practise, so I also use my own tests which incorporate all the main spelling patterns covered in this blog, match my workbooks, and which I'm putting on this blog as fast as I can. There are also quite nice little nonword tests here and here. By the way, I searched the internet for the business names I made up for this blog post, and they are all in use as real, meaningful words by someone, somewhere. Shoup, Prantine, Dearm, Jauri and Kough are family names; Noe is a place name; breaf and gey are slang; peopard is a pattern; classage is a French word, and Chooque seems to be a prolific gamer's nickname. The gap between real and nonsense words is not wide (even "blog" was a nonsense word 15 years ago), and we all need to be able to read both. Don't be scared: nonsense words are just words we haven't met yet. This entry was posted in assessment, new words, sound-letter links, word attack on December 23, 2012 by alison. As with most of the topics on which you write, I love your piece on nonsense words, Alison 🙂 Next time I see someone whingeing about them, I shall point them in your direction. A family member linked me to your resource. Thanks for the details.